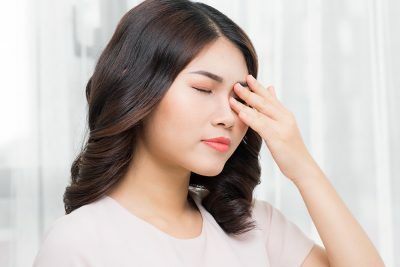 Professionally manicured hands surely draw a lot of attention, but regular salon visits to maintain them is really not a viable and pocket-friendly option for most of us. Applying nail polish on your own might sound like a cakewalk, but it can turn out to be a frustrating test of your fine motor skills, especially when using your non-dominant hand. However, with a little practice and some helpful tips, you can master the skill of applying nail polish perfectly and without leaving your cuticles stained. To achieve flawlessly painted nails, invest in a good quality nail lacquer – there is no other way of doing it. You can try out an Essie or OPI. These nail polishes last longer, don’t chip off easily and do not stain your nails too much. Also, don’t try to hold on to that bottle of your favorite nail color for eternity. If the liquid has turned gluggy, it’s time to ditch the bottle and get a new one. It’s also a good idea to buy yourself a base coat and top coat. Not only do they extend the life of your nail polish, they help strengthen and protect your nails, too. 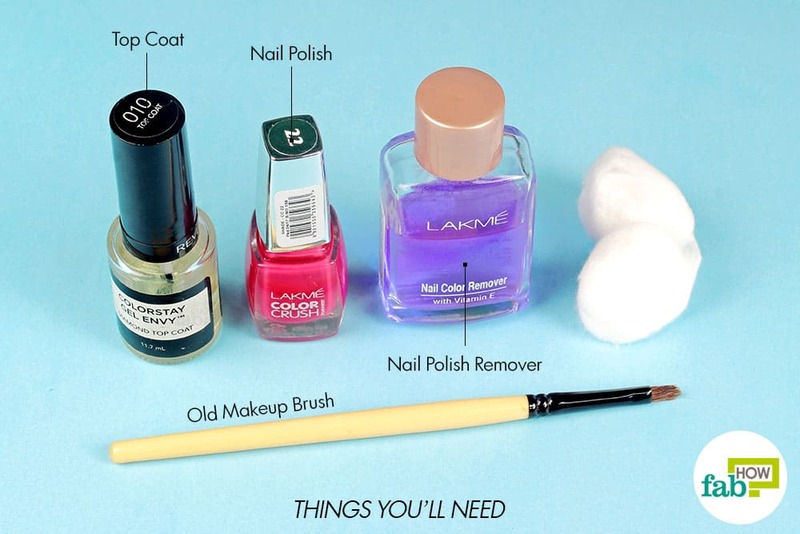 Now that we have a few basics in place, read on to learn how to apply nail polish step-by-step like a pro. Use a non-acetone remover to clean off old nail polish. Acetone leaves your nails super dry and can make them brittle over time. 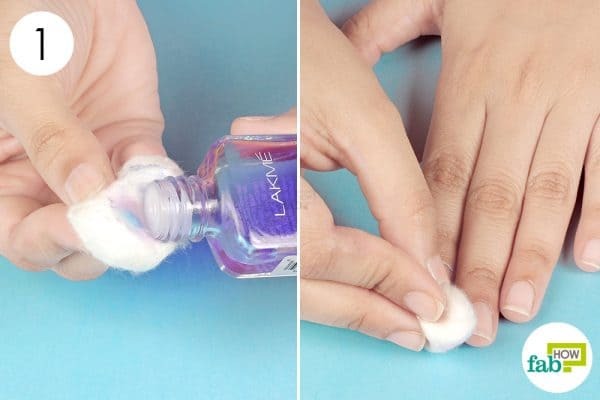 Saturate a cotton ball with non-acetone nail polish remover. Rub it over your nails to remove any old polish. Use a fresh cotton ball if the first one gets too dirty. Also, trim, file and smooth out your nails with a buffer before proceeding to paint them. It is essential to use a base coat. It makes your nail polish last longer and protects your nails from staining, especially if applying a dark color. Essie Ridge Filling Base Coat is a good option. Dip the brush in the base coat and wipe it on the rim of the bottle to remove the excess from the brush. Apply a thin base coat, using just 2 or 3 strokes. Let the base coat dry before you proceed with applying the polish. 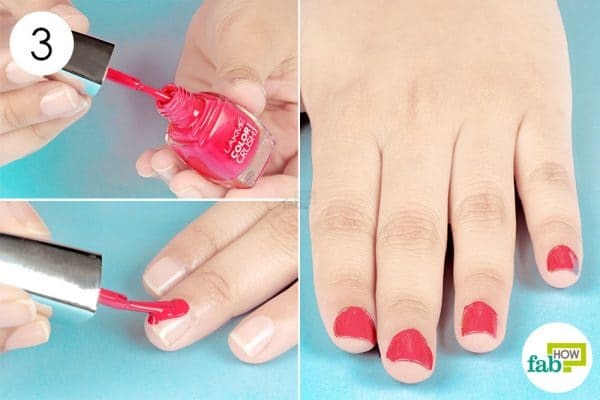 Dip the brush in the nail polish so you have just enough to apply one thin coat. Remove any excess polish from your brush by wiping it along the rim of the bottle. Place a small drop of the polish near the base of your nail, slightly away from the cuticle. Push the polish up to the cuticle line, leaving a hairline space between the polish and the cuticle. Then, drag the brush down in a straight line, starting from the base of the nail toward the free edge. Swipe the brush along the left edge to coat the side of the nail. Do the same for the right side. Make multiple light strokes, if needed, to even out the polish. Repeat the process for all your nails. Allow your nails to dry completely before applying the second coat. For the second coat, use more nail polish but lighter strokes to avoid smudging the first coat. Proceed to apply a third coat only if you want a deep color. Otherwise, 2 coats are enough. Let each coat dry before proceeding to the next step. 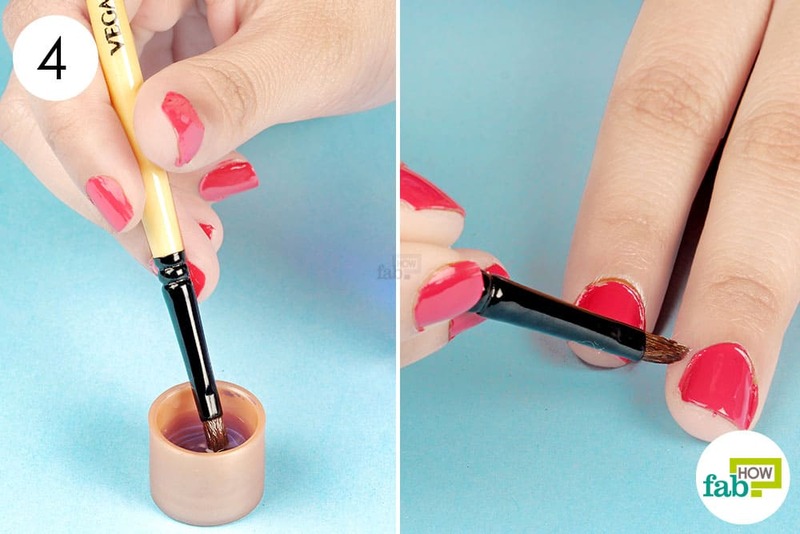 Dip an old makeup brush in nail polish remover. Carefully rub off the smudges of nail polish on the skin around your nails. Top coats are essential to make your nail polish last longer, prevent chipping and add sheen to your nails. You can use a quick-drying top coat like OPI RapiDry Top Coat or Revlon Extra Life No Chip Top Coat. Dip the brush in the top coat and apply it over each nail using 3 strokes. Keep the strokes very light to avoid digging into the nail polish. Wait for the top coat to dry completely. If you’re using a regular top coat, you can dunk your nails in ice water to speed up the drying process. Pat dry and apply baby oil over them. Your fresh nail polish is ready to be flaunted! Answer nature’s call before starting your manicure. It certainly helps to avoid smudges. Never shake your nail polish, as shaking will cause bubbles in the polish. Instead, roll it between your hands while holding the bottle vertically. 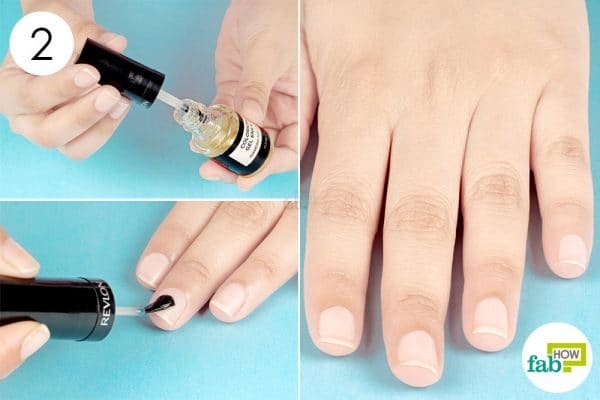 You can spray some cooking oil onto wet nails to help them dry pretty fast. If applying a bright polish, start with a white base coat to pop up the color. Apply nail polish in a well-lit room. When painting with the non-dominant hand, move your fingers around the brush instead of moving the brush. Store your nail polish in a cool and dark place. Nail polish can change in thickness and color when exposed to light or heat. You can also store them in your refrigerator for longer shelf life. Do you have a post about applying acrylic nails? More of DIY acrylic nails. Yes we do have articles on how to apply ,maintain and safely remove acrylic nails at home.